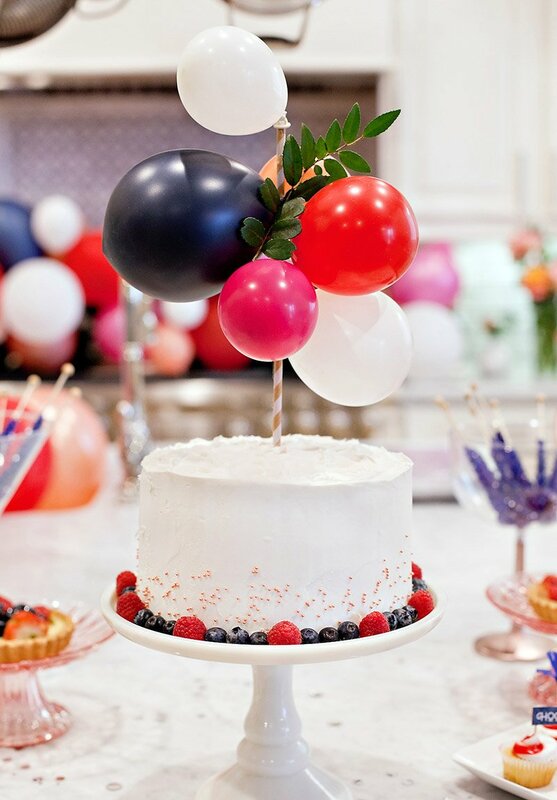 If you’ve got a reason to celebrate coming up – from birthdays to bridal showers, anniversaries, and beyond – I’ve got just the theme for you! 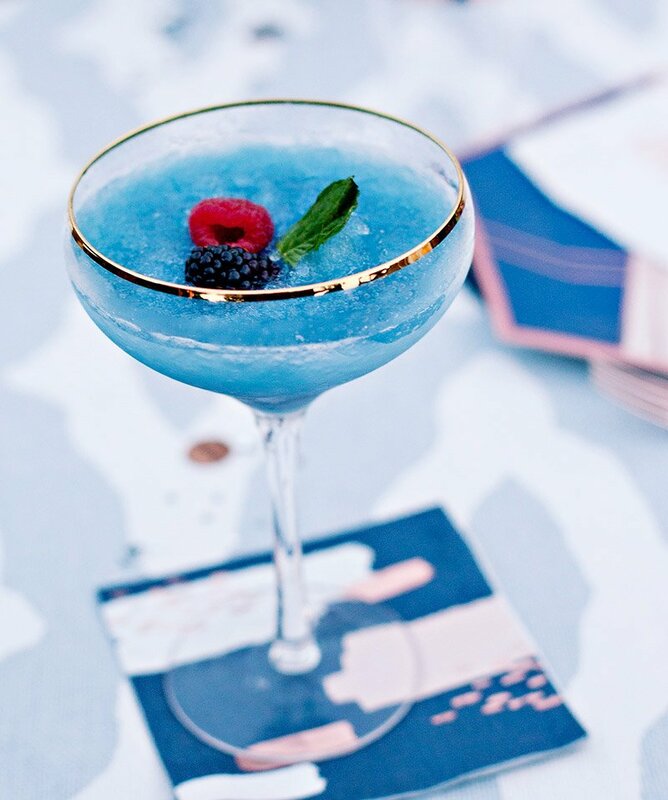 Our new “Festive Garden” Cocktail Party combines fresh greenery, big pops of color, and hints of metallic glam for a look that’s warm, versatile and fun. In related news… we recently teamed up with Master of Mixes – America’s #1 cocktail mixer company – to help them celebrate their brand new look! For a long-established company with so many different products that retail all around the world, a rebrand is a big deal and a huge undertaking. I would venture to guess that it’s even a little bit scary mixed in with all the excitement! Well, Master of Mixes officially unveiled the new look TODAY, so this is one of the first places you will see the new packaging. 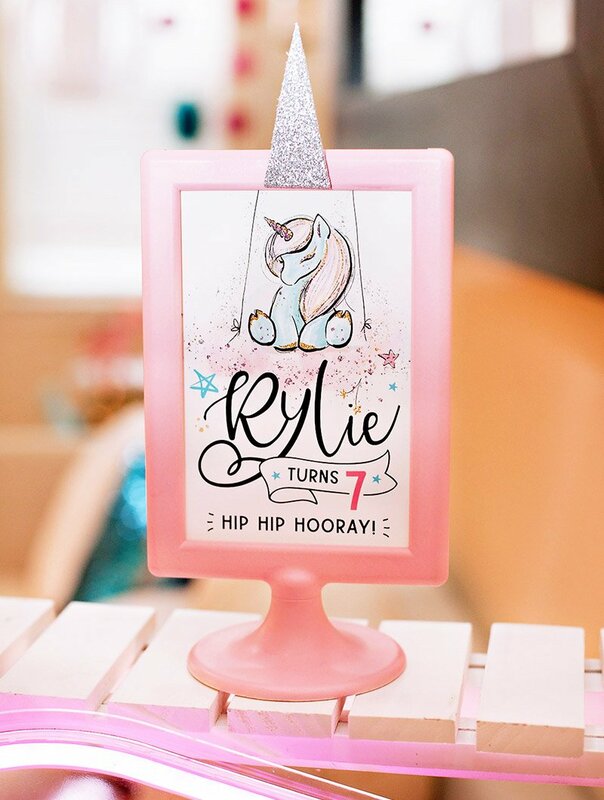  I think the updated design does a great job of showcasing their fun and flavorful personality, and is definitely a milestone that calls for celebration! This is the first of several party themes we’ll be bringing your way throughout the year as part of our collaboration with Master of Mixes. Each theme will be filled with visual inspiration, creative and doable ideas, free downloads, and – of course – delicious DRINKS! 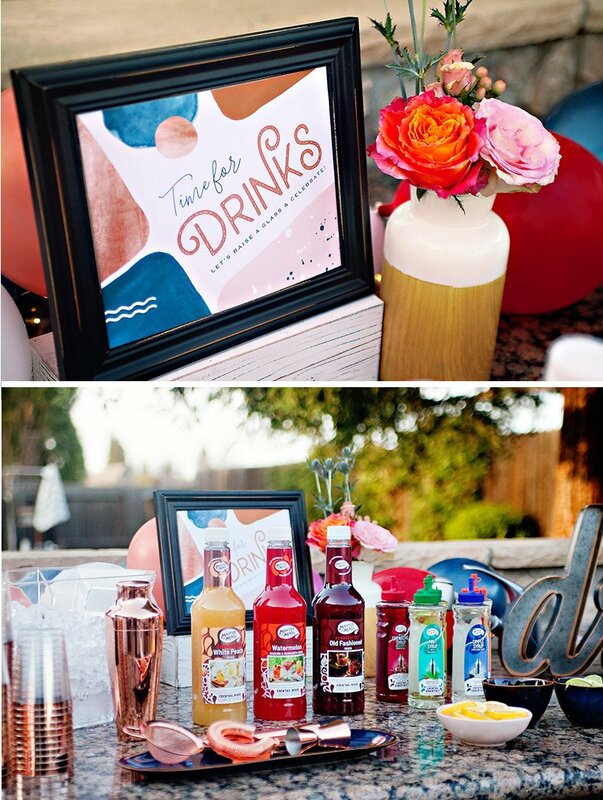 Mini drink stations are such a fun way to greet your guests! 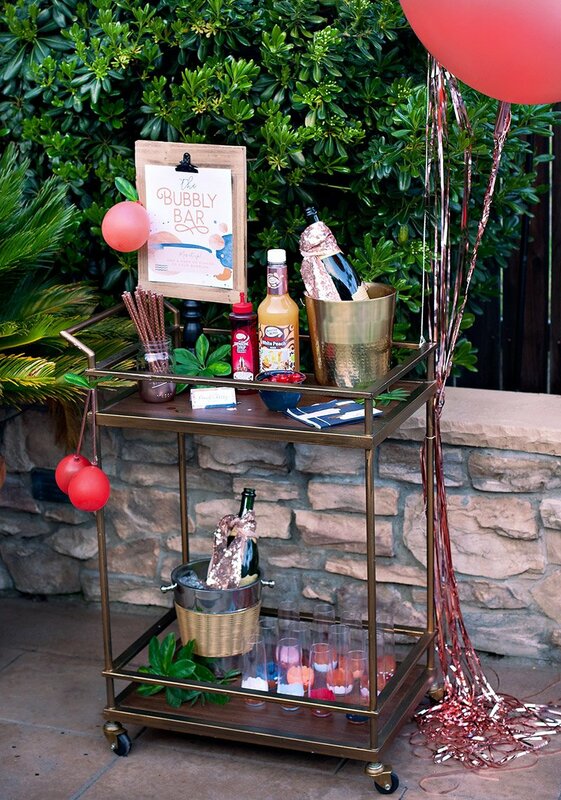 We used a portable bar cart to set up a special place for our champagne-based signature drink, the “Peach Cherry Bubbly”. The recipe is simply 6 oz of champagne with a dash (or approximately a half ounce each) of Master of Mixes White Peach Mixer and Grenadine Syrup. Yum! 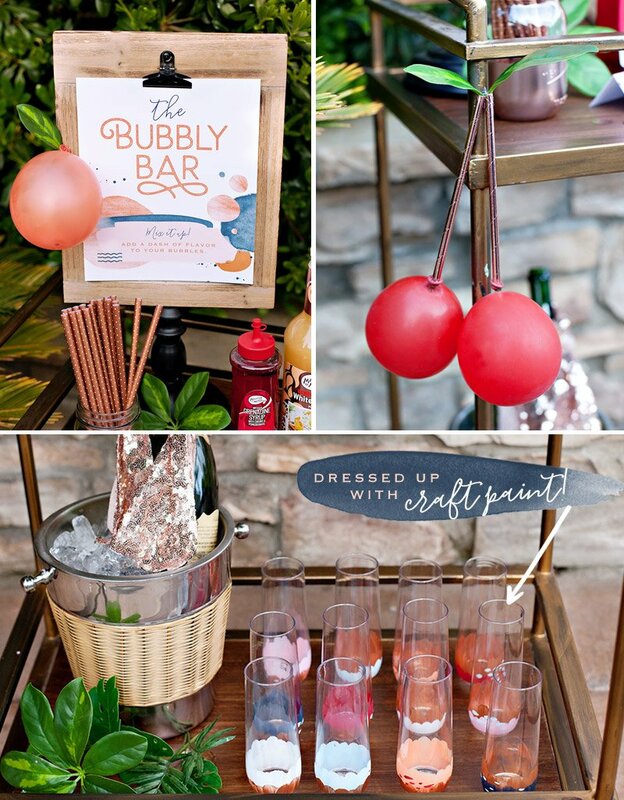 I designed a (free printable) 8×10 Bubbly Bar Sign for this station and styled it out with a some playful creative details like “peach” and “cherry” mini balloons! 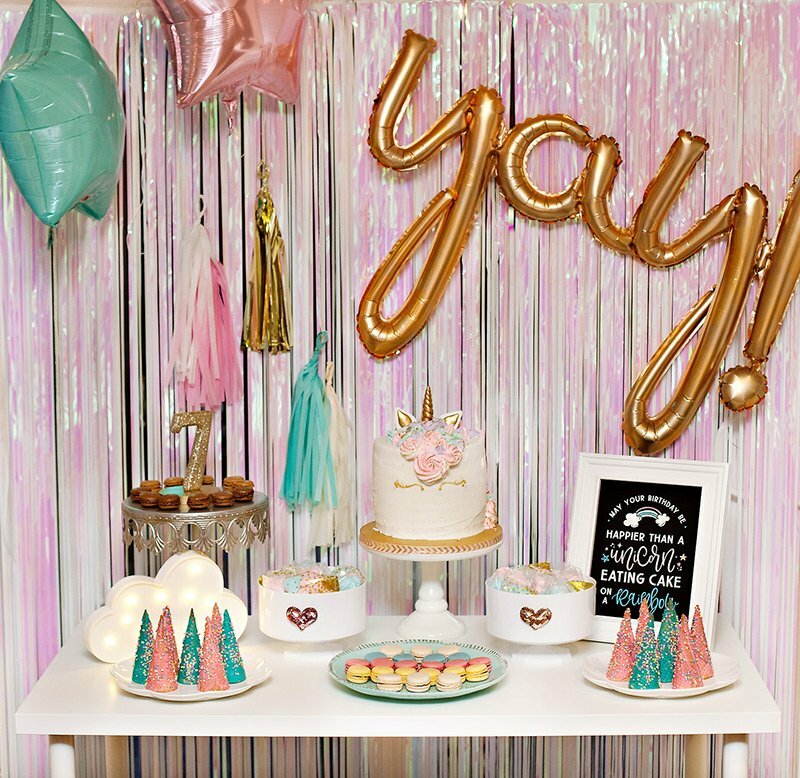 The sparkly tassels on the giant balloons were cut from a rose gold foil fringe curtain. To recreate this look – just use a paint brush with an oval shaped tip, and make short, vertical brush strokes all the way around the bottom. Let that dry, then repeat with a 2nd color a little ways down. Dab on little dots and dashes for the finishing touch. These flutes look extra pretty filled with Peach Cherry Bubbly! Pretty appetizers don’t have to be complicated! 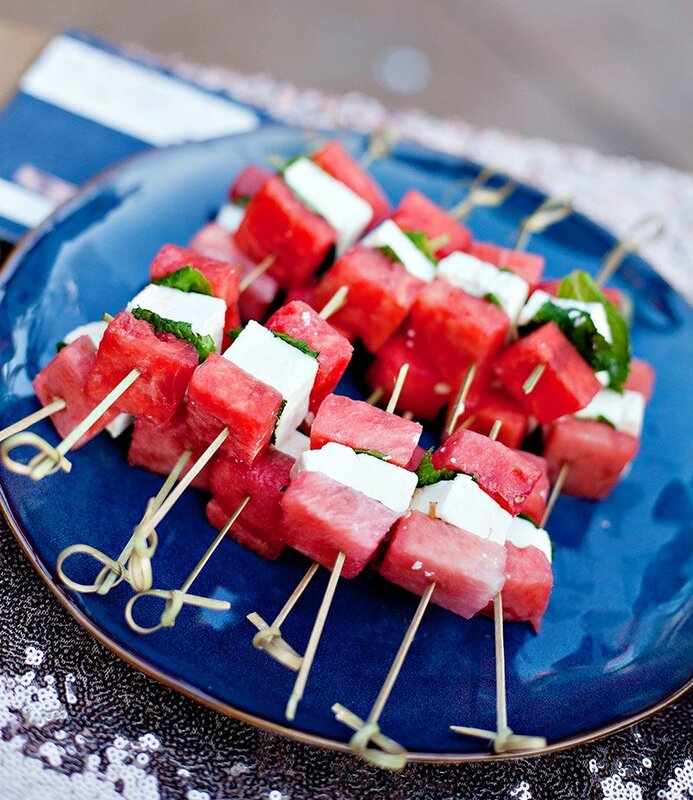 Include a couple easy, no-cook options in your party menu that taste AND look great, like Watermelon-Feta-Mint Skewers and Blueberry Ricotta Crostini drizzled with honey. 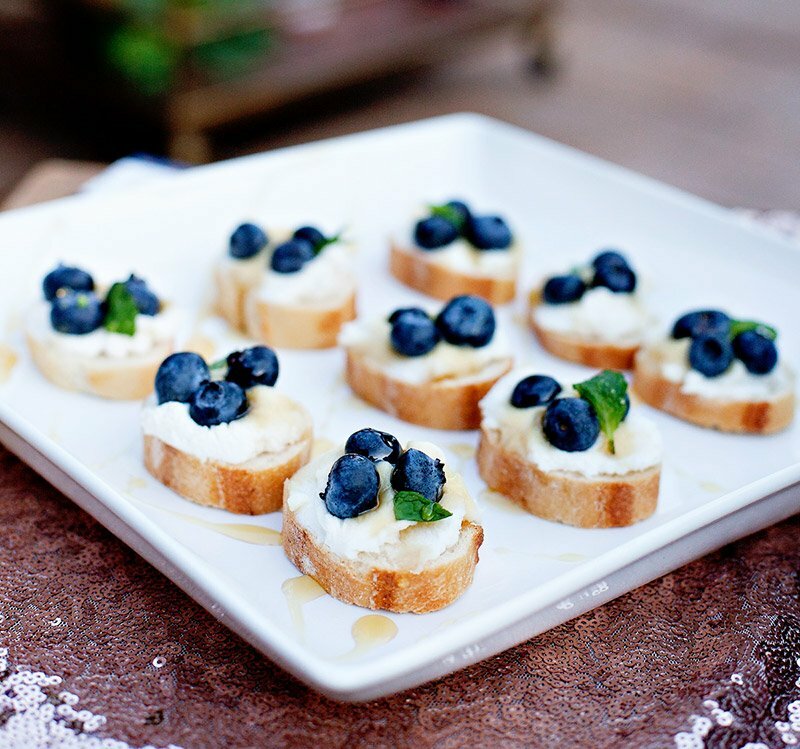 The ricotta crostini is made from toasted baguette slices topped with ricotta, fresh blueberries, and honey. Garnish with mint leaves for extra flavor and lovely “garden party” vibes. I’m a big fan of warm, inviting tablescapes that have hints of “fancy” without feeling super formal or overdone. This rings especially true for outdoor parties! 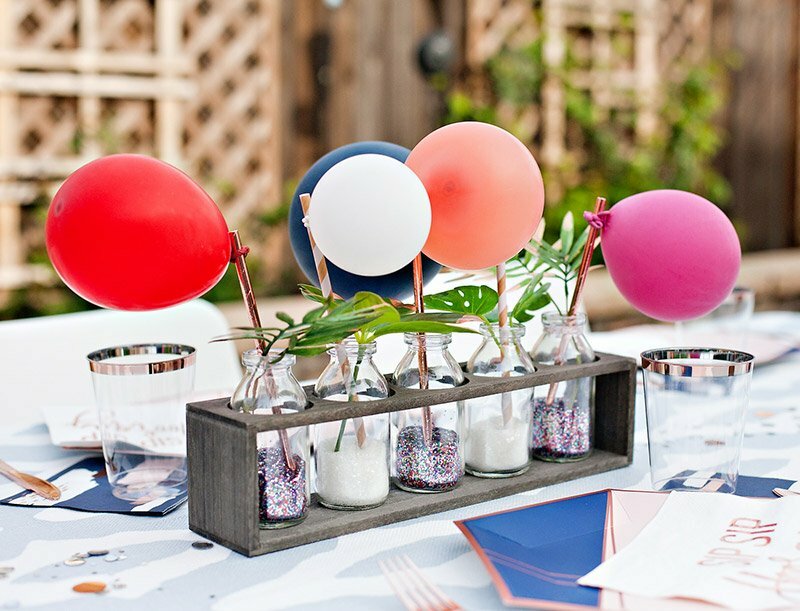 For a unique twist on your centerpiece, go with a combo of small balloons and greenery instead of flowers. I used a mix of (partially inflated) 5” and 12” balloons for this design. 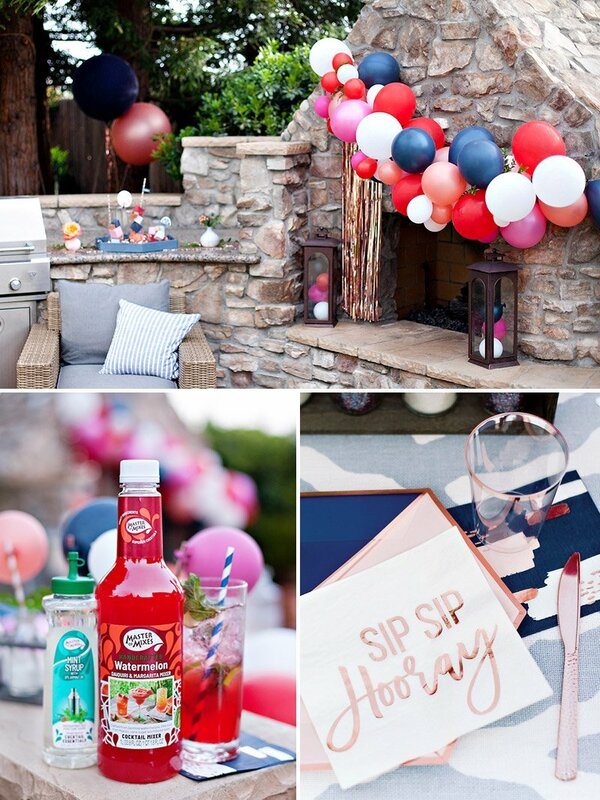 The balloons were tied to decorative party straws and displayed in small bud vases filled with glitter. Accent greenery was also glammed up with a touch of rose gold paint on the leaves. 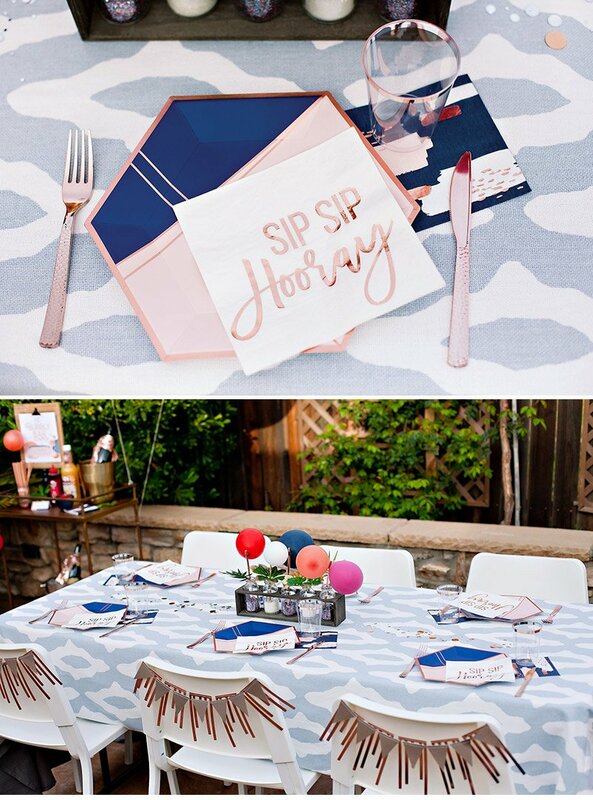 One of my favorite tabletop tips is to think outside the box when it comes to “table linens”. This will vastly expand your design options, especially when budget is a factor. For example, the “tablecloth” pictured here is actually a curtain panel! 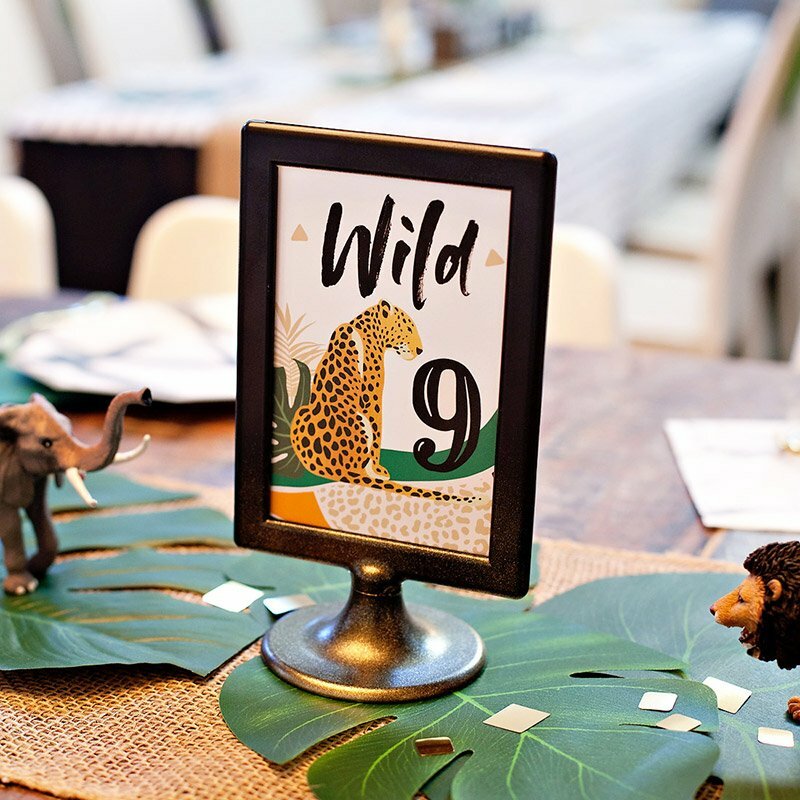 The purchase price was about the same price as renting a standard solid party linen, and WAY less expensive than renting a “designer” linen with this sort of look. 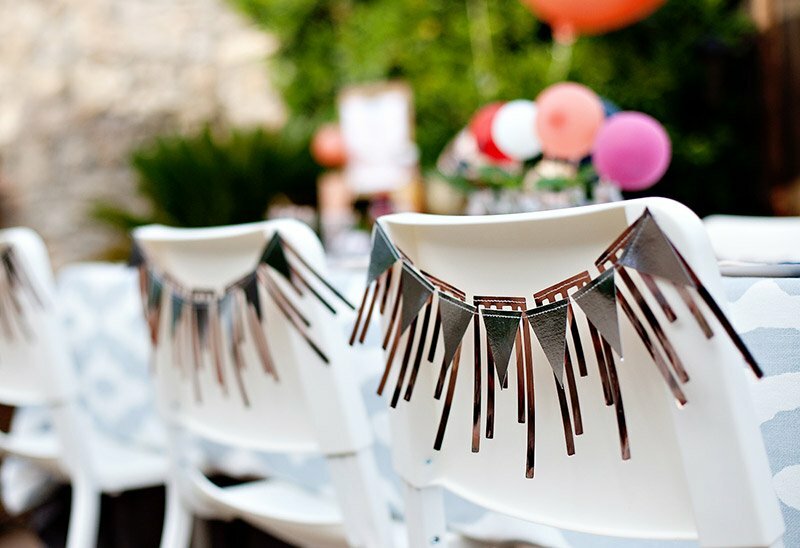 For the chairs, I cut up store-bought geometric banners (in rose gold and silver/gold) and attached them to the chair backs with glue dots. Thread the large balloons together through their tails, mixing up the colors as you go. Push the strung balloons pretty close together, until you like how it looks. Hang or place the garland wherever you’d like to display it. 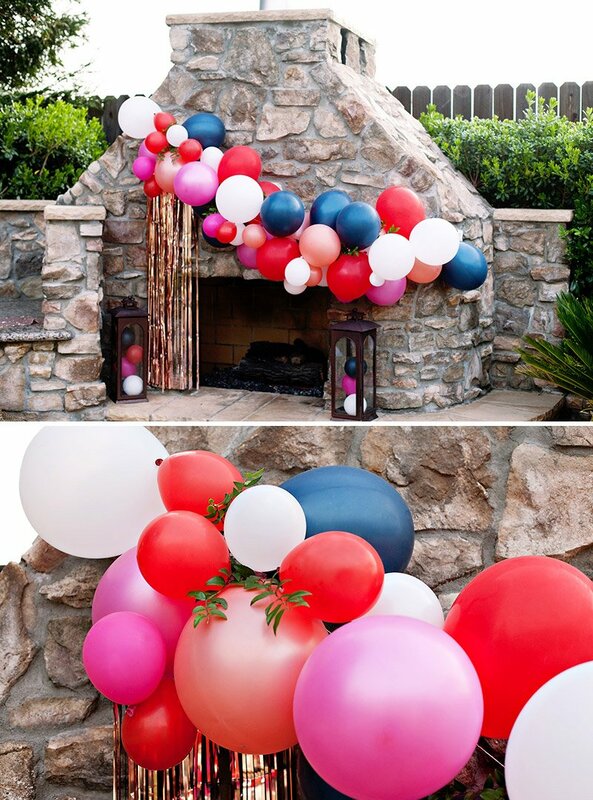 Use lots of 5″ balloons to fill in gaps and add dimension to the garland. Attach them with glue dots or rolled tape. 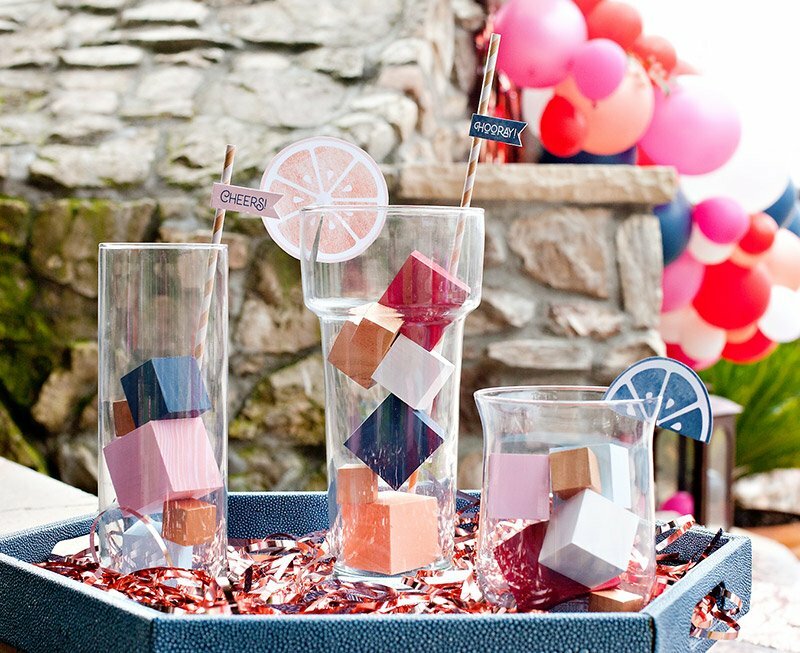 Another fun element your guests don’t see every day… giant “cocktails” with wooden block “ice cubes”! These vases were 6″ to 11″ tall. The wood blocks used for the ice cubes were a mix of 1″, 1.5″, and 2″. 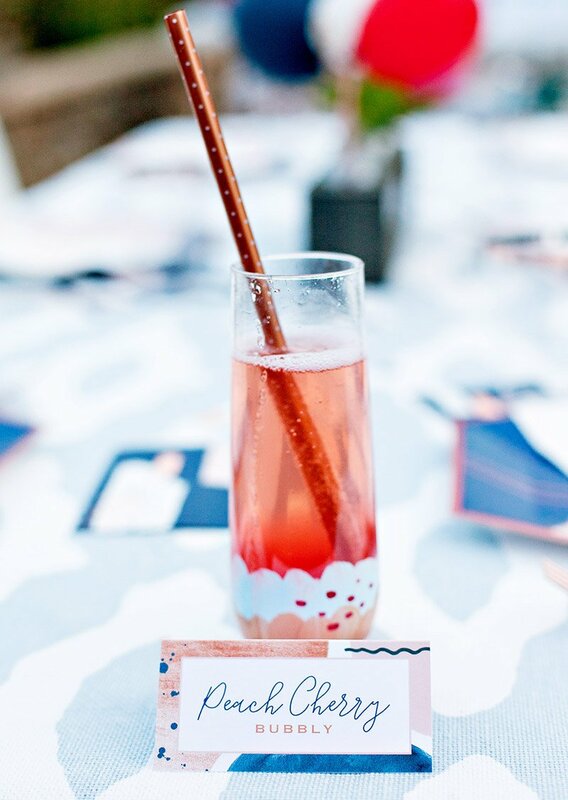 Party straws and printable “drink garnishes” made for the perfect finishing touch! Also – don’t feel like you have to offer a full bar set up at all of your parties. 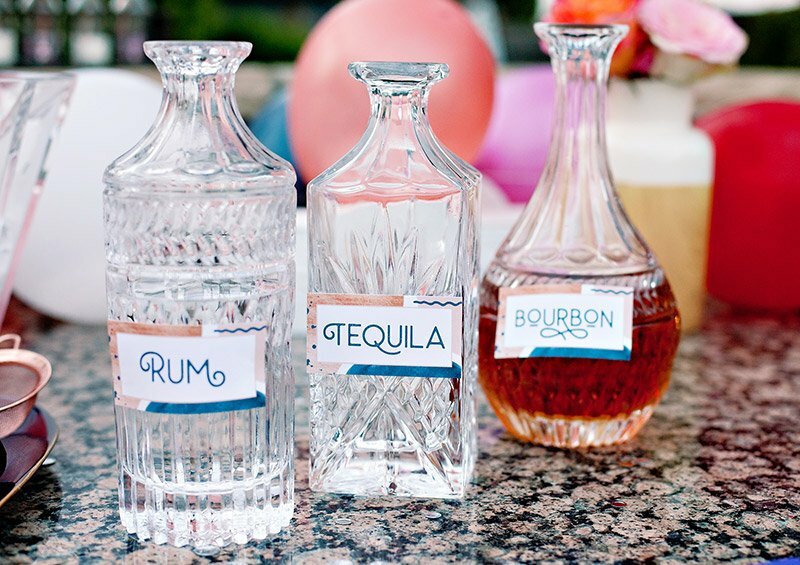 3 to 5 types of alcohols plus a variety of different mixers will create plenty of cocktail options for your guests. Master of Mixes Cocktail Mixers make ALL the difference here. These high quality mixers simplify your favorite drink recipes and keep flavors consistent, making delicious cocktails fast and easy to whip up. 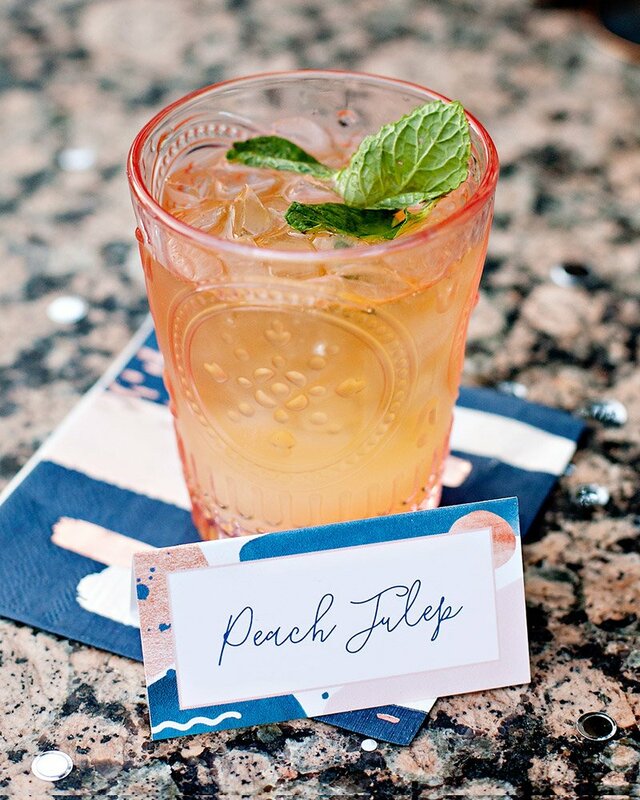 For this signature drink menu, we used 3 Master of Mixes flavors – White Peach, Watermelon, and Old Fashioned – plus Grenadine and Mint Syrup from their Cocktail Essentials line. I also set out a few other Cocktail Essentials flavors in case guests wanted to use them for scratch cocktails, too. 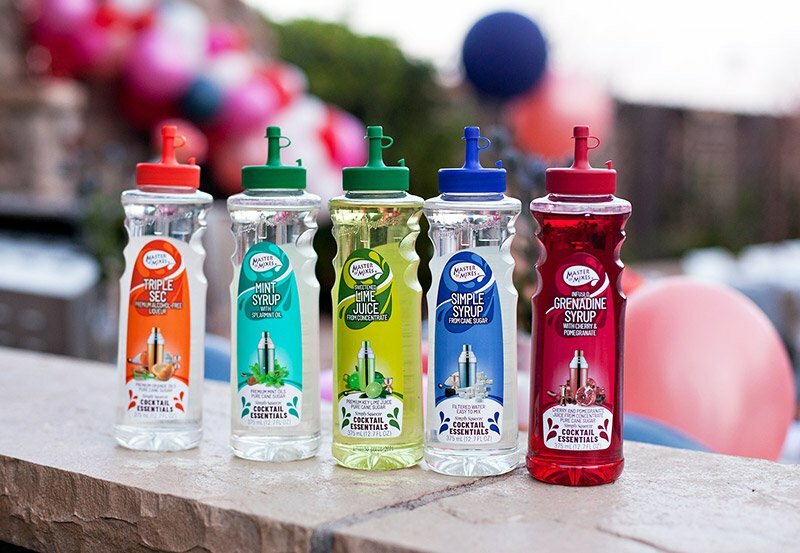 Plus, the colorful bottles look great displayed together on the bar, so that’s an added bonus! First up is the Peach Julep. 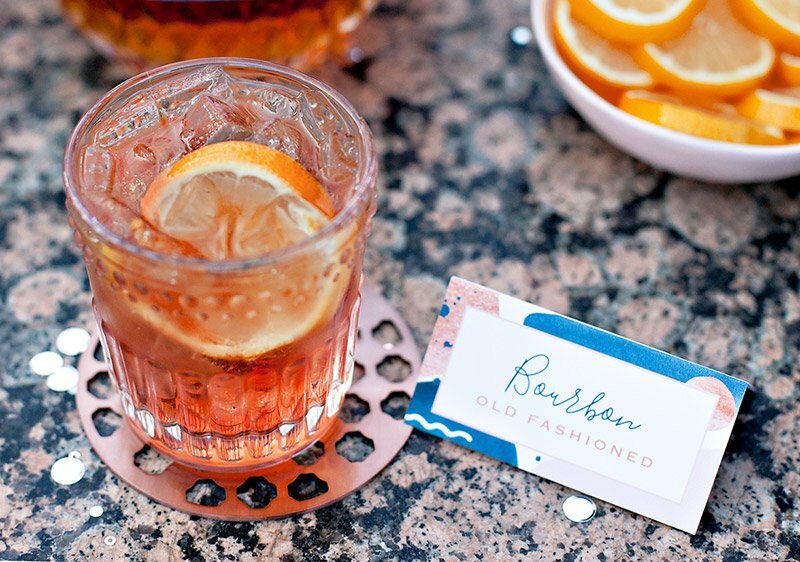 (Consider this one for your Kentucky Derby parties, too!) It’s made from the White Peach Mixer, Mint Syrup, and bourbon. One of my personal favs is the Watermelon Mojito, with its vibrant pops of red and green. 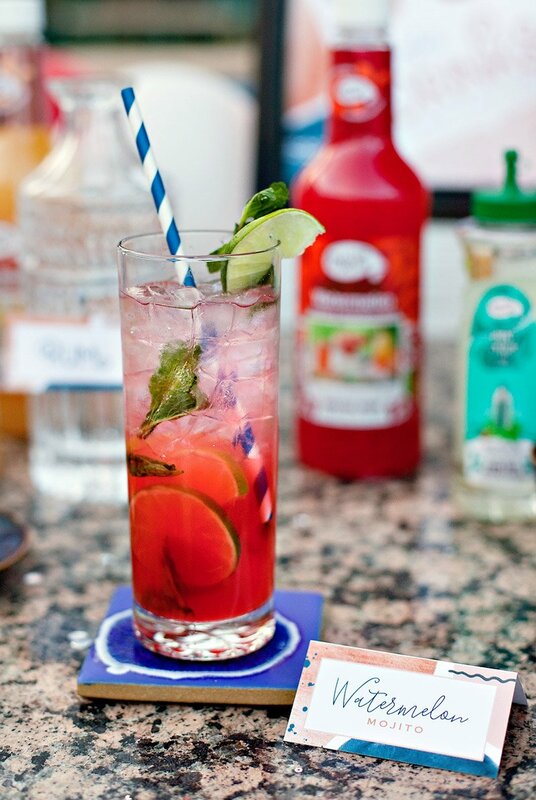 This recipe features the Watermelon Mixer, Mint Syrup, fresh limes, rum, and soda. 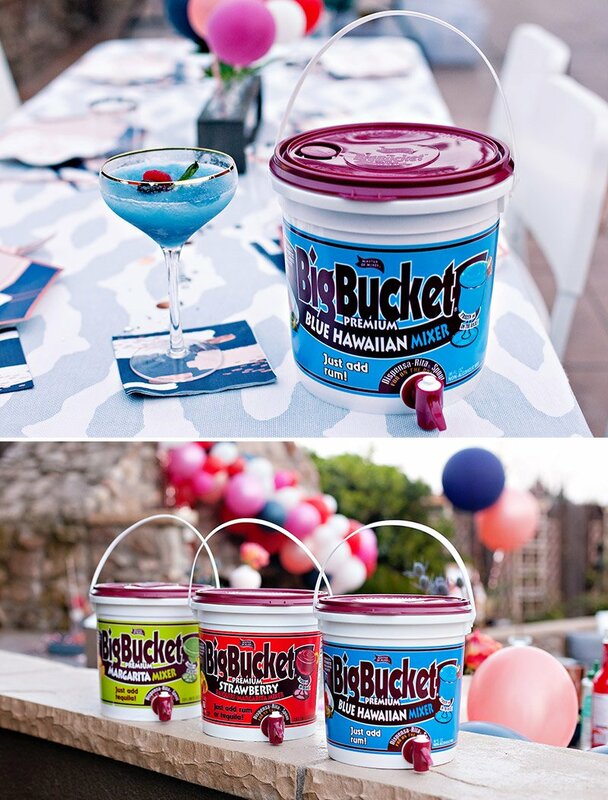 Start with the Master of Mixes Big Bucket Blue Hawaiian Mixer. Pour in a bottle of raspberry vodka (750 ml) + 12 oz of cranberry juice. Freeze overnight (or for at least 8 hours) – and done! Remove from the freezer for a bit and stir before serving. To make it extra pretty, garnish with berries and mint! 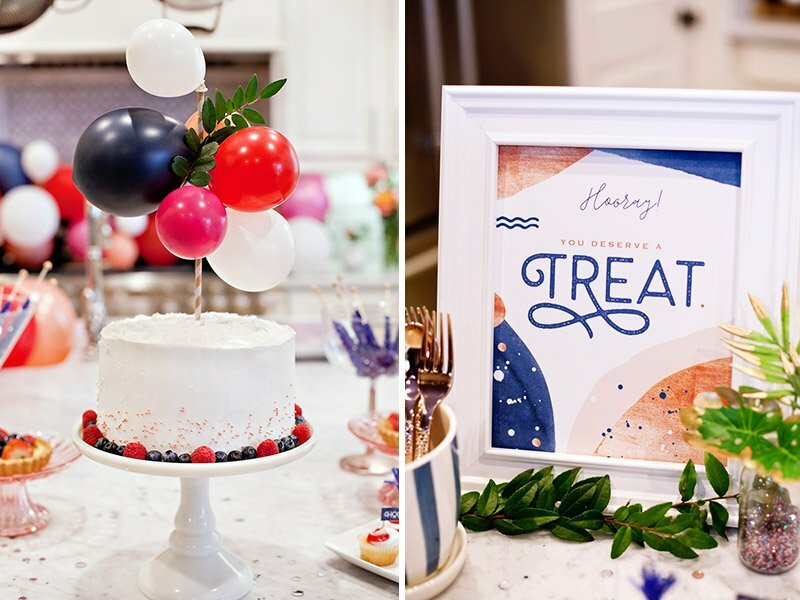 Here’s a sneak peek of our matching dessert station for this theme. Head over to the full post for a closer look!